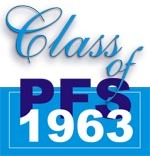 Welcome to the new Official Site of Class of 1963. This site is the result of the donations and contributions of all present at the Come Together Nite at the OFA on 7 April 2003. A meeting of schoolmates and classmates, some who met for the first time after leaving our alma mater for 40 years. The joy, oh no it was rather the disbelief that the someone you knew 40 years ago has transformed into some other size and shape that made the meeting an end to their suspense & expectations. Many shook their heads in disbelief in what they saw in flesh and bone, sorry more flesh. Many kept asking to confirm. Anyway those who were not present should have seen the expressions on everyone's faces as if a long lost brother had come home. Nearly 50 of us congregated at the school field which used to be the battle field for glory and medals. We had a walk down memory lane - a retro. Went into the building and tried to look for our classrooms. Went into the canteen and of course remembered the Prefect's Room (the hatred of the wayward). Then the battle was on again - football. Home against Away. Believe it or not, the away won. Ong Chong Hye, who recently had a heart by pass, scored the only goal. That night amidst the rain and thunder, the group met at the kopi tiam run by Peng Kiat where we ate, drank and talked till the cows came home. Still unsatisfied, a buffet dinner at the OFA was held the following night. Another 20 others who did not come for the retro at PFS joined in that night at OFA. Everyone was given the chance to talk. At the dinner a 2 minute silence was given to the few who could not be with us - Dr Tai Lung Ho, Sasson Hai Jacob, Dr Loh Hun Eng, Gajah Toh Cheng Swee, Goh See Hong and Ch'ng Kim Ling. Of course Robert Ong sang followed by a few other newly emerged Ka lah ok Singers. And all of them were good! We have vowed to meet again at another place and time - soon. China maybe! Over to Gan Khai Choon. Who is Tang C M?